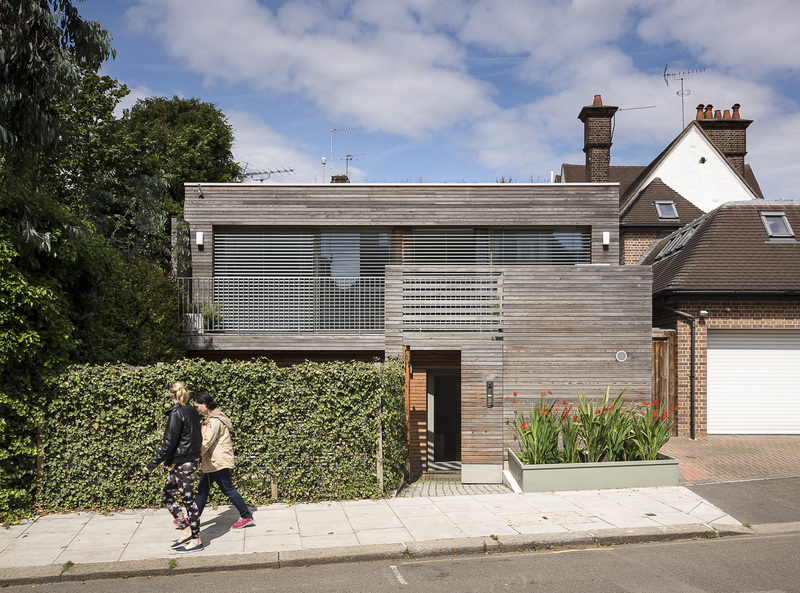 This timber framed 118m², two bedroom house is the first certified Passivhaus in London, setting a benchmark for energy efficient designfor the city. The primary objective of the project was to achieve a comfortable home for the client’s young family, while minimizing energy consumption. It is constructed with a heavily insulated prefabricated timber frame, clad in European larch. It is cheap to run, achieving a heating saving of 90% compared to existing housing; low in carbon emissions; and is bright and airy, with sliding doors on to a south facing terrace. The site is located in London which means that the over-shadowing of adjacent buildings had a major impact on the energy balance and design decisions. The Passivhaus Planning Package (PHPP) was used from the very start of the project to determine the optimum position for the house on the site and the optimum percentage and orientation of the glazing. 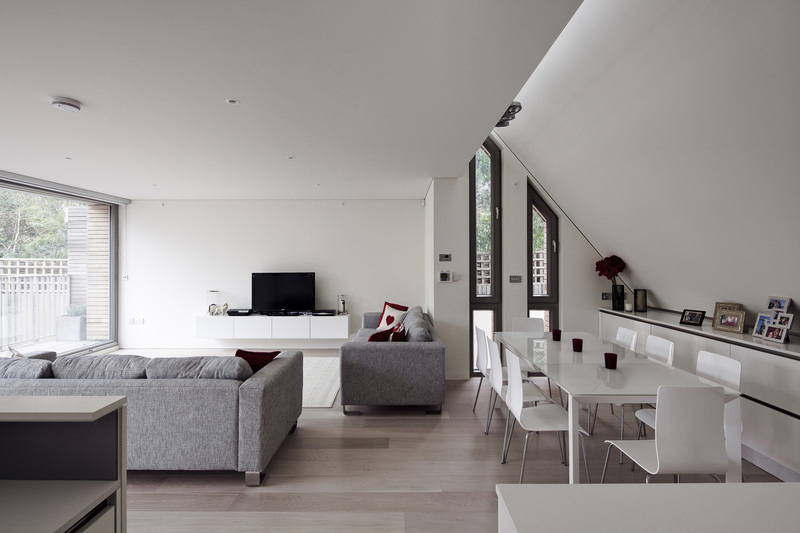 The final design of the house provides bright and airy rooms with large, tilt and slide, draught-free triple-glazed windows to the south and west. The house is designed to use less than13 kWh/m2/a for heating. Summer shading is provided by means of retractable external venetian blinds with automatic solar control, whilst inward-tilting windows provide secure summer night-timepurge ventilation. The house uses non-toxic materials to avoid polluting the air and, together with the heat recovery ventilationsystem, air quality is very high. A water filtration system ensures perfectly clean water for both drinking and bathing. Mains water use is reduced by an underground rain water harvesting tank, which provides water for the garden. A solar thermal panel supplies domestic hot water via a compactunit with a tiny back-up gas boiler. The project goes beyond the required regulatory minimum standards exceeding part L 2006 by 70% and meeting the carbon compliance limit for 2016 zero carbon homes. Total emissions are 10.2kg/(m2a)excluding appliances and 23.6kg/(m2a) overall. Regulated emissions (SAP eq.) are 16.84kg/(m2a). Biodiversity was very important for this project which incorporates two, wild flower meadow, green roofs, a southfacing garden and, as planned, an ivy covered gabion stonewall. The house was granted Passivhaus certification and completed in Spring 2010.